Why pigs? And other answers to other questions. 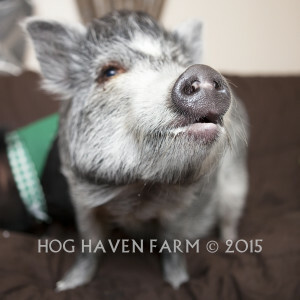 At Hog Haven Farm, we get asked a lot of questions. Sure, it isn’t every day you meet people who are determined to do everything they can to support, rescue, educate and service the community with potbellied pigs. Many of the questions we are asked are centered around the bathroom habits of pigs–and the rest comparing pigs to dogs. People need a reference point to understand the connection of pigs as pets–and here is the answer to our most frequently asked question: Why Pigs? Let’s talk first about the concept of keeping domesticated animals as companions–i.e. pets–in our homes. Psychological studies over the last decade have agreed that there are both physical and psychological benefits of maintaining a human-animal relationship. Research suggests that keeping a pet can reduce stress, lower heart rate and blood pressure, reduce depression, loneliness and isolation, and increase social interactions and connections with those who have similar pets. Whether it be a typical household pet–such as a dog, cat, or bird–or an exotic pet, the bond between humans and companion animals is undeniable.